I had my own bedroom in the spacey basement of this totally wooden house in Fort Langley. This is where I ended up at 4am this morning, so I was very happy that Kirsti and Steven gave me the chance to sleep in. What are you doing up that late, Ramon? I started doing my writing thing after midnight and when I start typing things, editing photographs and processing emails, time is rushing by. Add to this the fact that I also have to write weekly chronicles for Dutch newspapers who expect an interesting story too and you understand why I wish that days exist out of 28 hours instead of 24. 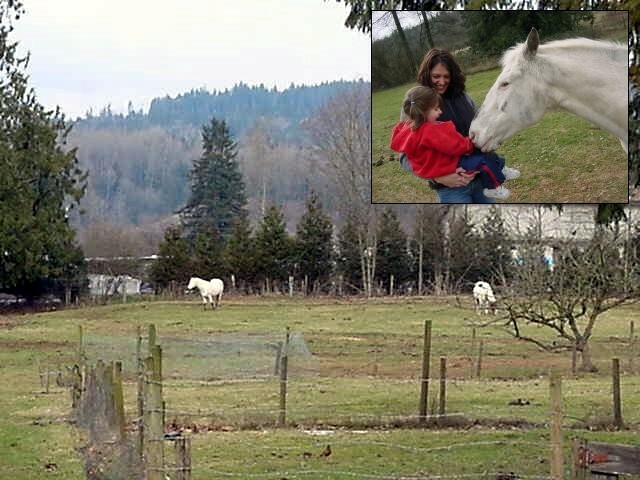 After breakfast it was time to feed the two horse outside in the field. The family here has a small 14 acres of land around the house and in there walk two very old houses. One of them is half blind and Kirsti took care of him when the previous owner wanted to put him asleep. And you know what, before I know I was horse riding around a bit! Today my presence in Langley made Kirsti and Steve decide to be a tourist in their own hometown too. 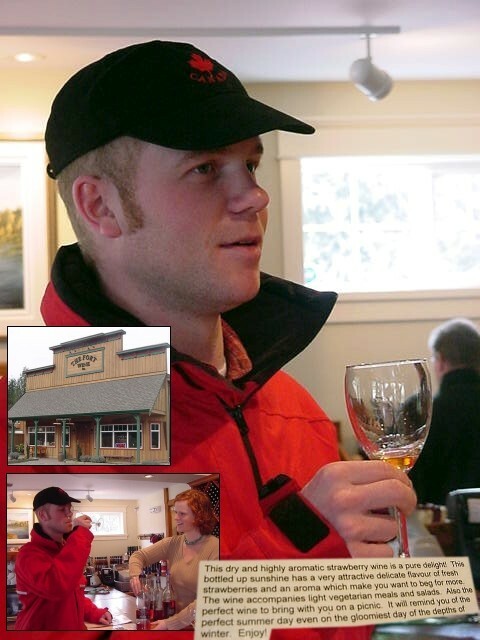 Therefore we first paid a visit to the local wine distillery, the Fort Wine Company, just a few farms down the road (I can�t speak about city blocks anymore, can I?). The uniqueness about this distillery (next to the very informative ladies behind the counter) is that they don�t make the original style wine, made of grapes, but they even made strawberry, blackberry, apricot and apple flavoured wines! Of course you can make wine out of everything (I have a very weird friend who prefers Polish potato wine above anything), but I had never truly tasted it. And the Langley wine company offers anybody who comes by and discovers this place the chance to taste three different flavours of wine. So I was sipping on the strawberry and got really exited about the apple wine. The apple wine is actually made of flash-frozen apples, which get crushed and the extracts from these iced apples are used for the wine. The Fort Wine Company ships abroad, so if you want to try different but great Canadian wines, get in contact with them! After all my chances of wine Steven bought a few bottles for tonight and we left, gently glowing a bit from the 9 nips of wine we had together. Our next stop was to the original Fort Langley, a national historic site of Canada. This is probably the main tourist attractions in Langley and this is the place where the entire existence of the province British Columbia is based on. Without Fort Langley this entire part of Canada coulda been Oregon Country and coulda ended up as another American state. Long before the European fur traders arrived, Aboriginal people lived here. Their elders might say they�ve been here �forever�; the archaeological evidence goes back at least 9,000 years. During those millennia, they established a highly evolved culture and a complex system of trading networks. In 1827, a Hudson�s Bay Company (HBC) expedition journeyed north from their bas on the Columbia River to establish a fort on the Fraser River. Twenty five hardy souls came ashore at Derby, just downstream from here, to the cautious welcome of the St�:l�, the local Salishan people. The early Fort Langley prospered as a HBC fur trade post, thanks in part, to marriages between Company men and St�:l� women, which helped the newcomers break into the established Native trade networks. Abundant salmon, fertile soil and Native labour allowed the Company to expand into farming and salting fish for export to new markets. In 1939, the original fort at Derby was abandoned and a new one was built on the current site. An agreement that year with the Russian American Company in Alaska meant more farmland was needed to produce meat, food crops and butter for the Russians, in exchange for an expanded coastal trading area. In 1846, negotiations between Britain and the United States of America finally set the international boundary at the 49th parallel, prompting the HBC to move its headquarters from the Columbia River, now in the US, to Fort Victoria on Vancouver Island. The Company also needed a new supply route north of the border to service its forts in the interior, and Fort Langley became the key transhipment depot. Furs shipped out from the interior posts through the Rocky Mountains to Hope by horse, then from Hope to Fort Langley by boats. Supplies and provisions made the trip back � and Fort Langley provided the important link to the ocean and international markets. Gold fever hit early in 1858 as reports of rich gold finds on the Fraser River leaked out. Grizzled miners, fresh from the California gold rush, and would-be prospectors from all walks of life, caught the gold fever and over 30,000 shipped north in search of quick riches. Fort Langley then achieved world fame as the starting point for the Fraser Gold Fields, and the fort was a constable bustle as minders stocked up for the trip upriver. The fort�s store raked in $1,500 a day � an enormous amount of money in those days. Fearful of American takeover of the territory, James Douglas, the Governor of Vancouver Island and manager of the HBC�s Pacific operations, took prompt action and declared the territory a British Colony, and on November 19, 1858, a gathering at Fort Langley�s Big House witnessed the creation of the Colony of British Columbia � with James Douglas as its first governor. Fort Langley�s role as a mining provisor abruptly ended from that year on. Fort Langley became �out of the way of travellers� and the fort swell slowly in disrepair. In 1923 the Canadian government recognized Fort Langley as a site of national historic importance, erecting a memorial plaque near the storehouse. The restoration of the fort continued as the centennial celebration of the founding of British Columbia approached in 1958, attended by the British Queen Elisabeth II. Steven paid the entrance fee for Kirsti, little Porsha and me and we wandered around the restored bastion for a while. A blacksmith was showing of his talent and made me a small curled piece of art that I could stick in a wall and use as a coat hanger. Neat! In one of the buildings on the grounds I was taught that story about the history of the fort and in the Big House we could see how the people used to live here. Did you know that some 150 years ago men would eat with their co-workers and bosses and that the women and the kids would eat in a separate room? What a difference! 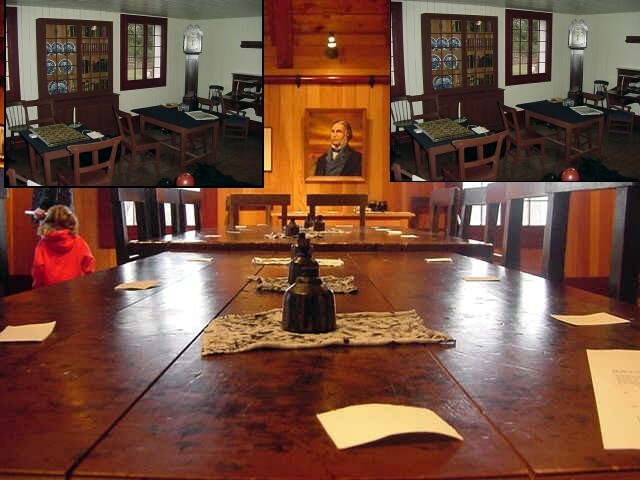 On the second floor of the Big House was the exact table where James Douglas declared the colony. It had all happened right there and it was a fascination to walk around and read all the information boards and look at the historical photographs on the walls. It was about an hour later when we got home again to collect the rest of the kids � who have been nicely doing their homework! � and we were all taken to a birthday party of Kirsti�s brother, his wife and their little son Joren, who lived in the coastal city White Rock. In the meantime it started to snow outside! At the family�s home in White Rock I met up with Kirsti�s relatives and her Dutch father and mother. They were the ones that took the family from the Netherlands up to Canada in 1980. The reasons for their move were economically, life was going downwards in the Netherlands at that time and Canada was promoted as one of the great countries to emigrate to and start a new living. It was an interesting night to hear those tales from the past. Meanwhile the family celebrated the birthday of Kirsti�s brother Irving, his Canadian wife and Joren. Songs were sung and presents were unpacked. All kids were excitingly playing around with new toys. But no buts were allowed and I enjoyed getting into their big automatic geared van and drive the family home. I felt myself in a quite honourable position as I was responsible for the safety of four kids and two adults and outside the snow was blinding my sight! After it was all a good experience. Steven is right about the fact that I have to �work on my corners�, because I am not used to automatic cars and not even those big ones! Back at home it was bed time for the kids. Steven, Kirsti and I stayed awake and watched the DVD of �Changing Lanes�, a nice movie about how life can make a change as soon as you consider the fact that you can change it all.